Who Should Start Seeds Indoors? Starting seeds indoors is quite the process, but don’t worry. It’s simple when you follow these instructions, and it gets easier with practice. There is an initial investment to acquire the equipment and materials, so if you’re new to gardening or are super-busy, it might be better, initially, to skip this step and buy your seedlings from a local farmers’ market or nursery. Many people are able to start all of their seedlings in south-facing sunny windows. You might give this a try if you have the right kind of windows. Unfortunately, my windows aren’t sufficiently sunny or spacious, so I embarked on a seedstarting mission with lights. You won’t find two gardeners who start seeds indoors exactly the same way. The following is the system that has worked for me. Your frost dates will determine when you start seeds. Once you know your frost dates, set a schedule for starting seeds indoors using my article When to Start Seeds: Your Guide to 30 Garden Vegetables. You may also want to check my Year-Round Gardening Guide which details to-do lists for each month. The shelves you choose will determine a lot of things, such as the size of your lights and how much of the other equipment you’ll need. I use the wall-mounted wire shelves in my mudroom. For most of the winter, these shelves act as our root cellar, where we store our harvested vegetables such as sweet potatoes, winter squash, garlic, and onions. A white board keeps me organized. I organize my garden books, seeds, and other supplies to kick things off. And a curious cat! You may prefer to buy a free-standing wire shelving unit or build your own wooden shelf unit. I think it’s easiest if you can access both sides of the shelves, but I’ve managed fine with single-side access to my wall-mounted shelves. The following supplies will make the whole process run smoothly. You won’t have to buy most of these items ever again! Check out my one-stop Amazon shop to see all of this equipment in one place. Full spectrum fluorescent light bulbs (2 bulbs per ballast). I recommend 32 watt, T8 bulbs. Step 1: Assemble the shelves. Assemble the shelving unit and set it in a level spot, in a room with as much ambient light as possible. My seed starting room is in the basement with no ambient light, so I cover the walls with aluminum foil (shiny side out) to reflect the light. Or try Mylar reflective film. Step 2: Hang the lights. Hang the lights using screw hooks or carabiners, and mount a fan at the end of each shelf. Step 3: Manage the temperature and humidity. Set out the heat mats on each shelf, and set out the thermometer on the shelving unit or close to it. The ideal temperature for starting seeds indoors is about 67 degrees F, give or take a few degrees. Because my operation for starting seeds indoors is in a small, enclosed room, I use a small space heater to warm the air, and I set my growing trays on bricks, which absorb and emit the heat. However, a heat mat is more energy-efficient for large open areas. As for humidity, seedlings prefer 50% to 70% humidity. Cool indoor air is usually dry, so keep a spray bottle of water in the room in case you need to mist the air (not the seedlings). Ready to get organized for the season ahead? When you purchase my book, The Suburban Micro-Farm, you get four bonus garden planning tools, including my ‘Seedstarting & Planting Worksheet’, that AUTOMATICALLY GENERATES all of your planting dates for you based on your frost date. Step 4: Manage the power source. Mount the power strip and organize the cords so they’re out of the way for regular seedling maintenance. All light fixtures should be plugged into the timed outlets and all the fans and heat mats should be plugged into the always-on outlets. No need to turn anything on yet. Organize the power cords so they’re out of the way as much as possible, and away from possible water spillages when the seedlings get watered. Use twisty ties to organize cords! Step 5: Assemble the materials for starting seeds indoors. Assemble your trays, cell packs, seeds, seed starting mix, steel tub, plant markers, Sharpie pen, watering can (filled), garden gloves and pencil near your work area (table or work bench). Step 6: Prepare the planting medium. Fill the tub with seed starting mix and add water, one gallon at a time, mixing just until the soil medium clumps together. It should feel like a wrung-out sponge: If water can be squeezed from it then it’s too wet. To remedy, add more soil. Excess planting medium can be saved. When you’re finished starting seeds, just let the medium dry out before storing it. Step 7: Prepare the cell packs. Take a cell pack and fill each cell to the top loosely with the seedstarting medium. Pack it in firmly, so that now each cell is only one-third to one-half full. Now fill each cell pack loosely with soil again to the top. This time, press lightly rather than packing down firmly. Pack the soil down in each cell, then loosely fill. Step 8: Choose a seed packet to begin starting seeds indoors. Select a seed packet to work with and consult your garden plans to figure out how many plants of that variety to start. Always start a few extra just in case. Step 9: Plant the seeds. Seeds should be planted twice as deep as their size. Plant at least 2 seeds per cell in opposite corners. Use the pencil to push the seeds in, then lightly press the soil on top so that the seeds are covered. Really tiny seeds, such as lettuce seeds, can just be pressed into the top of the soil mix, rather than buried. Step 10: Label the cell packs. Label each cell pack with a plant marker. Step 11: Fill the drainage tray with cell packs. Place the cell pack in a drainage tray. Step 12: Water the seeds in. When the drainage tray is full of cell packs, water each cell very lightly to ensure the seeds have made contact with the soil. My little green watering can for houseplants is perfect for watering in seedlings. I’ve finished starting seeds for February…more to come in March! Step 13: Cover the trays for germination. Cover the tray with plastic wrap or a plastic dome and set on a heat mat. This keeps the seeds warm and moist to increase germination rates. Cover seed trays with plastic wrap for germination. Turn those lights off. Step 14: Start the rest of your seeds. Continue the process until all seeds have been started and all trays have been set on a heat mat. Step 15: Turn on the heat mats. Make sure all heat mats are on. Lights and fans are OFF until the seeds have germinated. Step 16: Check daily for germination. Each day check for germination, briefly lifting the plastic wrap or dome to allow some condensation to escape. Once seeds have sprouted, immediately remove the plastic wrap covering. Step 17: Set the lights on a timer. Once the seeds have germinated and the covers have been removed, turn the lights ON and the fans on low. Turn OFF the heat mats, unless the temperature in the room regularly dips below 67 degrees F.
If you’re short on heat mats, prioritize their use for the following heat-loving crops: eggplants, peppers, okra, watermelon, and tomatoes, which prefer temperatures to be closer to 80 degrees F.
Set the timers for the lights on the power strip: If your seed starting room has ambient light from nearby windows, allow your plants to follow the natural cycle of daylight hours. To do this, program your lights to turn on at sunrise and off at sunset on the longest day of the year in your region (the time of your summer solstice). For example, in my region I would turn the lights on at 6am and off at 9pm, for a total of 15 hours of light. This keeps my plants on a natural cycle, and I like to believe it eases their acclimation to the outdoors. Note: If you’re starting seeds indoors in a windowless room like me with little-to-no ambient light, it will benefit your plants to keep the lights on 24 hours a day. In this case, the timer isn’t necessary. Step 18: Position the lights. Using the adjustable chains on the light fixtures, position the lights 10 inches above the seedlings. Adjust the lights regularly as the seedlings grow. Once your seeds have germinated and are under the lights and fan, check frequently for dry soil mix. Let the soil mix dry completely before adding water. This will reduce the chance of the seedlings getting a fungal disease called “damping off”, which is a common disease in seedlings with too much moisture. To water, remove one cell pack from a tray and fill the drainage tray halfway with water using the watering can. Replace the cell pack. Set a timer for 10 minutes, then check all the cells for moisture. When the cells are all sufficiently moist, carefully dump out the excess water from the drainage pan. Watering from below instead of above reduces the incidence of damping off. If you have a damping off outbreak, immediately remove the affected plants and put them in the garbage. Sprinkle cinnamon on the soil of the remaining healthy seedlings to minimize the spreading of the damping off fungus. Cinnamon is a natural anti-fungal that won’t damage healthy seedlings. Step 20: Thin crowded seedlings. The seedlings must be thinned once they’ve produced their second set of leaves, which is their first set of true leaves. If there’s more than one seedling in a cell, remove all but the strongest and most vigorous seedling. Use garden scissors to cut off the weaker and more slow-growing seedlings at the soil level. DON’T PULL THEM OUT, as doing so may disturb the delicate root system of the remaining young seedling. Step 21: Fertilize young seedlings. The first set of leaves of a seedling acquires nutrients from the seed itself, requiring no fertilization on your part. As the seedling grows, however, it will develop its first set of “true” leaves. These true leaves are a sign that the seedling has used up its stores of nutrients in the seed and requires outside fertilization. Since the seedstarting mix is free of nutrients, you’ll need to fertilize. To water the seedlings with fertilizer, add one tablespoon of fish fertilizer per one gallon of water and mix well, following the directions on the label. Use as part of the regular watering schedule. Step 22: Re-pot growing seedlings. As the seedlings grow, you may need to transplant them out of their cells and into their own plastic pots. If your seedlings have more than 2 sets of true leaves, check your planting schedule. How long until they are planted outside? If you have more than one week until transplanted, you’ll want to pot them using potting soil (not the seed starting mix). Keep in mind that the pots take up more space and they might not all fit under the lights. Try to keep them all in rotation between the lights and nearby sunny windowsills. I’m hardening off my seedlings in the garage. Step 23: ‘Harden off’ the seedlings before planting. 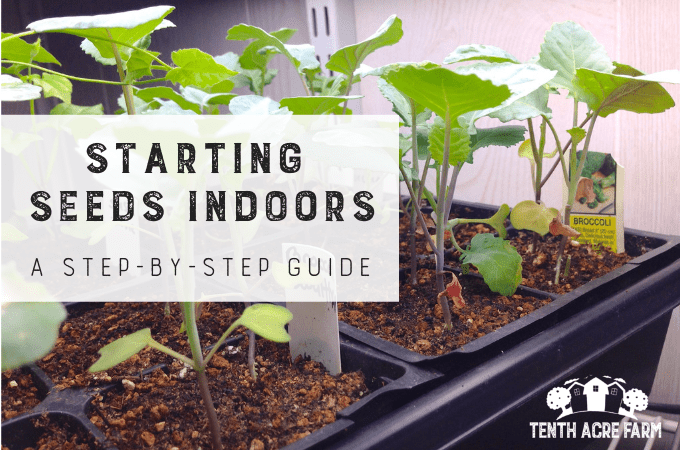 When starting seeds indoors, there is a key step in transitioning the seedlings to the outside world. One week before the seedlings are scheduled to be transplanted outside, they must go through the ‘hardening off’ process. This is the process by which we acclimate them to their new outdoor home. The sunlight, dry air, and cold nights outside will be a shock to them. Protect them from hard rain, heavy wind, or extreme temperatures during the process. Water frequently, as needed, but do not fertilize. Partial sun is better than direct, full sun. Daytime temperatures should be in the 60s F or near. If extreme temperatures or heavy rain is called for, it will be better to delay the hardening off process. Day 1: Place the seedlings in a shady spot outside. Don’t forget to bring them inside at night! Day 2: Place them in a sunny spot for 2-3 hours, then back to the shade for the rest of the day, coming in at night. Day 3: Increase to 5 hours of sunlight, coming in at night. Day 4: Increase to 7 hours of sunlight, coming in at night. Day 5: Increase to 9 hours of sunlight. Can remain outside at night if temperatures are in the 60s F.
Day 6: Increase to all day in the sun and overnight outside. Day 7: Plant in the garden if no extreme weather is on the horizon. If it is, wait it out. Step 24: Transplant the seedlings into the garden. Prepare the area that you intend to plant in by loosening the soil and amending it with compost, worm castings, or other soil amendments. Wondering which soil amendments are right for your garden? 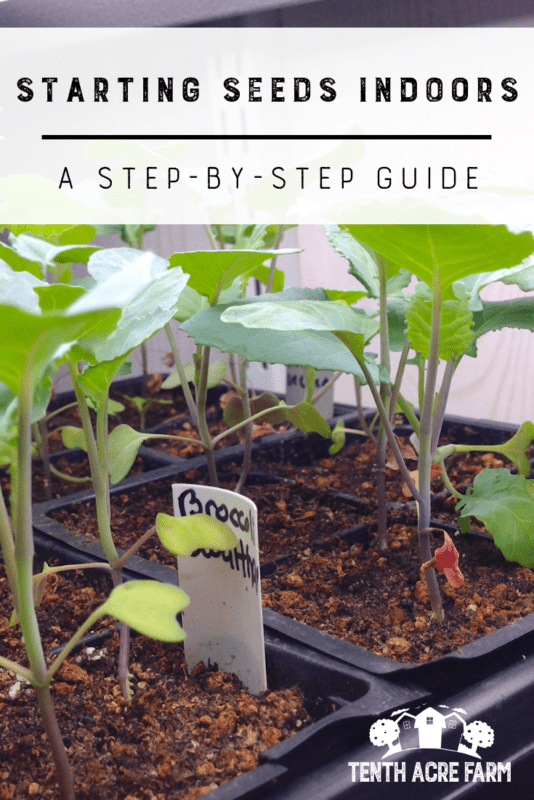 Get my free Guide to Organic Soil Amendments to find out! Turn the pot upside down and firmly tap the pot against the palm of your hand. Push the seedling out of the container from the bottom. Never pull on the stem of the seedling to remove it. Transplant it into the garden. Water the plant deeply, using a diluted fish fertilizer, and check on the newly planted seedlings regularly. Step 25: Protect the seedlings from cold. If temperatures take a sudden dive, be prepared to cover newly planted seedlings with row cover, buckets, plastic sheets, a cold frame, or anything else you can find. A wire A-frame with a plastic sheet thrown over it works well. FAQ: Oops, I’ve missed the seed starting date. What can I do? 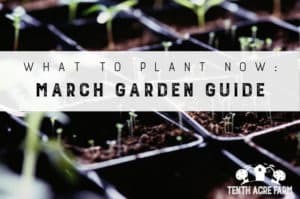 If you’ve missed seed starting for a particular crop, have no fear. There is often a window of at least four weeks (and often more) to start seeds. Consult my article When to Start Seeds for details. Beyond that, seedlings are often available online or from local nurseries. And that sums up starting seeds indoors. Will this guide help you give it a try? If you have your own indoor seed starting routine, what did I miss? Great post Amy, the most comprehensive I have read. I especially appreciate the hardening off schedule, most of the directions I have read were so vague. Thank you so much for taking the time to post such organized information. I would just like to know more about the shelving. I am trying to grow about fifty flats of flowers and believe your growing set up would work out for growing that many plants. Where did you buy them? I’ve looked on several websites but seems like they only offer 3 ft. wardrobe shelves. Thanks again and any information you would suggest about growing those many flats would be helpful. This would be my first time growing seed indoors or ever for that matter lol. Hi there. Do you mean the wall-mounted shelves? Those were installed by former owners of our house, so I’m not sure where they came from. I would check the big box stores, as well as places like The Container Store. Sometimes shelving of different sizes can be ordered for you even if it isn’t available on the store shelf. You can see in the fourth picture that the number of existing brackets weren’t sufficient to hold the weight of our seed starting activities, so we had to reinforce the shelves. I really like the versatility of free standing wire shelving units, which can be pulled away from the wall or moved if needed. Although they are not picture here, I’ve used them with success in other seed starting operations. If you’re interested in that kind of setup, there is a link in the text below the fourth picture. starting seeds indoor for the first time and this post was SO helpful! Great article. The most comprehensive I’ve read. Very easy step by step. Love it. Thanks! Such an informative article. I’m grwoing from seed for the first time. My seedlings are getting their first set of true leaves. How often do you recommend watering with fish fertilzer? Thank you! Exciting! I water with fish fertilizer every time using a weak dilution. Thank you so much! This was incredibly helpful! DO you keep your seed heating mats on past germination? Like throughout the growth process? I turn off the heat mats, unless the temperature in the room regularly dips below 67 degrees. Heat-loving crops: eggplants, peppers, okra, watermelon, and tomatoes prefer temps around 80 degrees, so these will do better with continuous heating. Thank you for the post! Very informative and love the photos, they are very helpful too!